India and Pakistan to Join SCO, Is Iran Next? After 15 years, the group is set to expand this summer. Fifteen years after its first, and to date only, expansion–the inclusion of Uzbekistan–the Shanghai Cooperation Organization is set to welcome two new full members this summer and a third may be on the way. At the SCO summit, to be held in late June in Tashkent, India and Pakistan are expected to formally join as full-fledged members of the organization. Meanwhile, Iran looks to be next in line. At present, the group’s full members are China, Russia, Kazakhstan, Kyrgyzstan, Tajikistan and Uzbekistan, with Afghanistan, Belarus, Mongolia, Iran, Pakistan and India as present observers. The groundwork for the admittance of India and Pakistan was set in 2014 with the finalization of procedures to take in new members during the Dushanbe summit. But as Ankit Panda wrote last summer, their full membership “doesn’t necessarily mean the SCO will start to matter more in Asia.” The addition of India and Pakistan–with 1.5 billion people between them–will decidedly expand the area under the SCO umbrella but the two come with considerable baggage. It’s not clear whether their membership will help mend ties, drag discord into the group, or not matter at all. India and Pakistan have difficult bilateral relations–particularly when it comes to discussing terrorism. Chinese leaders are optimistic their membership in the SCO will help build bridges, but the fact that the two are nearly always at loggerheads over security issues–a major piece of what the SCO tackles–makes it seem a fantasy. Indian and Pakistani troops, for example, participating together in a joint SCO military exercise would be quite a landmark event. But these are old arguments, expressions of long-standing skepticism. The deal is essentially done and Russia is already looking to the next expansion. UN sanctions had kept Iran’s full membership off the table, but with the nuclear deal implemented earlier this year sanctions have been pulled back. 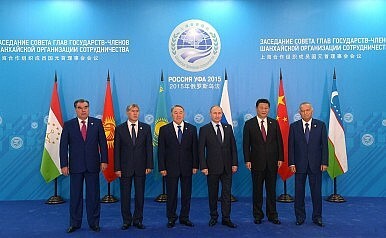 China and Russia–the two dominant members–have different priorities with regard to the SCO. The Chinese focus on economics, mentioning the “alignment of development strategies… based on the joint construction of the Silk Road Economic Belt.” Not that Beijing ignores security–it’s fully behind counterterrorism cooperation, for example, as well as promoting stability in Afghanistan–but it doesn’t view the SCO as primarily a security or ideological forum. The SCO is a means toward an end, that end being economic development without the need for Beijing to invest–unilaterally–in security issues. On the other hand, as Joshua Kucera said earlier this year on Eurasianet, “Russia, however, sees it more in ideological terms, as a means of weakening Western global hegemomy by creating a sort of anti-Western club.” The inclusion of India, as Panda pointed out last summer, muddies that vision–but Iran’s membership might balance that. At the next SCO summit in June, the matter of calming tensions between its newest member states, India and Pakistan, is paramount. Could the SCO Expand Into the Middle East?The Shanghai Cooperation Organization: Harmony or Discord?Can the SCO Bring India and Pakistan Together?SCO Set to Expand, Adding India and PakistanHow Important Is China to Central Asia?